Are you looking these days at particular markets or industry sectors to invest in? We don't get involved in picking sectors. But if you are talking about a particular size of company then, yes, it is certainly a good time to invest in smaller companies. Actually, there are attractive stocks of all kinds and sizes in many markets. Hong Kong is obviously doing very well. Taiwan is doing quite well. But much more than markets or sectors, we emphasize a bottom-up approach to picking stocks. So, you're trying to pick winners regardless of the market they're in? No, that's not true. If I'm really, really bearish on a market -- Thailand, for example -- I'm going to be reluctant to invest at all. I think because the economic downturn in Thailand is so severe, it is difficult for any company to be immune. The first quarter earnings results from Thailand were disappointing. And I believe there is room for further earnings revisions downward as the year goes on. But if you're staying away from entire markets, doesn't that restrict very much the universe of stocks you have to pick from? In our small capitalization fund, we're actually careful not to spread ourselves too thin. We believe in having a concentrated portfolio -- not more than 50 different stocks in the fund. We don't want to own more than 100 stocks with less than 1% weighting each. When that happens, even if the share price doubles, it's not going to impact the net asset value of the fund very much. And not just that. With smaller stocks, you have to pay close attention. But how can you if you have too many holdings? You can't. With a small-cap fund, how important is it to establish personal relationships with the companies you invest in? Basically, we try to visit each of our companies once or twice a year. We're out to build a relationship with them. Smaller companies are generally not as widely covered as the larger blue chips. If something happens that you need to find out about in a hurry, you may not be able to get the information from your broker's research. It always helps if you can call up the company and ask what's going on. Besides establishing a good relationship, what are you looking for? We try to pick those companies with high quality earnings, good cash flow and a management we feel comfortable with. The lack of good, available information on small companies sounds dangerous. Given that, why would an investor want to take a risk on small-cap stocks? The ideal situation is to find smaller companies that are under-covered, under-researched and under-valued. If you can find them, the potential for capital appreciation is great. Liquidity is a key. If a stock were very illiquid, we would not buy it even if we were very confident of the fundamentals. We don't want to be stuck. At the same time, we don't discriminate against entire markets because of the perception that the market is not liquid. In our experience, you can find a company that is reasonably liquid in any market. Of course, by itself that doesn't mean you want to invest. Which markets do you like? And, besides Thailand, which markets would you stay away from? Hong Kong is my favorite. 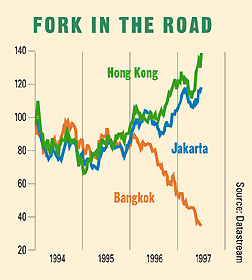 And we're bullish on Indonesia. We see good earnings growth there, and inflation is coming down. As for the downside, the Philippines, for one, may be a problem. I think there is a lot of concern about earnings growth. Until the Chinese government took steps to cool them down, the region's hottest stocks have been Hong Kong red chips [Hong Kong-listed stocks with strong links to the mainland]. Is it time to step back? There is obviously red chip euphoria at the moment. I would say that is because there is so much liquidity in Hong Kong, especially coming in from the outside. And there are expectations that Chinese money will support the market. I think an investor will do fine if he is selective and picks red chips with strong backing and transparent, good quality earnings.